The winter weather pattern is in full swing here in southwest Florida. Cool mornings with warm afternoons have been the norm with an occasional blast from the north. The fish are still biting well and that should continue, thanks to new moon tides and provided the weather holds. Live shrimp has become the bait of choice. Fish are cold blooded and they don’t need to feed quite as much when the water temperatures are down so now is the time for what we call slow and low. Keep baits near the bottom and avoid quick movements. Fish aren’t going to chase their food very far. 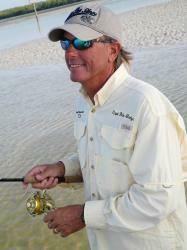 Seatrout are making a nice showing in the south end of Pine Island Sound, Matlacha Pass and on the flats in Estero Bay. Poppin cork rigs have been the gear of choice. Once located, anchor up and work the area thoroughly. Artificials have been working during the afternoon warm up, but remember to work them slowly. Redfish have been the target in the later part of the day on higher tides. Look for them up under the mangrove overhangs and along oyster bar points and drop offs. Live shrimp on lead head jigs has been working best, but keep them in place on the bottom without a lot of movement. Patience is a virtue and it doesn’t hurt to use some shrimp as chum. 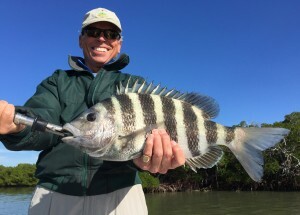 The creeks have been loaded with sheepshead. Downsize the leader and hooks to trick these great bait stealers. We’ve had luck with number 1 hooks and a small split shot for weight. Give them a chance to eat and then reel when you see the line move. No creek access? No problem. Find a dock with good water movement and you’ll find the sheepies. Pompano numbers are up and they are feeding best around the pass openings on sandy bottom in about 4 feet of water. Small yellow jigs hopped across the bottom and tipped with shrimp have been working best. Best way to find them is to pay close attention when approaching the area you want to fish. They skip out of the water when startled. The nearshore reefs have been great for mixed bag fishing. Spanish mackerel are near the surface and will chase most anything that looks like a small baitfish. There have also been quite a few bluefish and blue runners in the same area. The rock piles are very active, but most of the fish have been small. Best bet is to work the sand around the piles for the bigger fish. 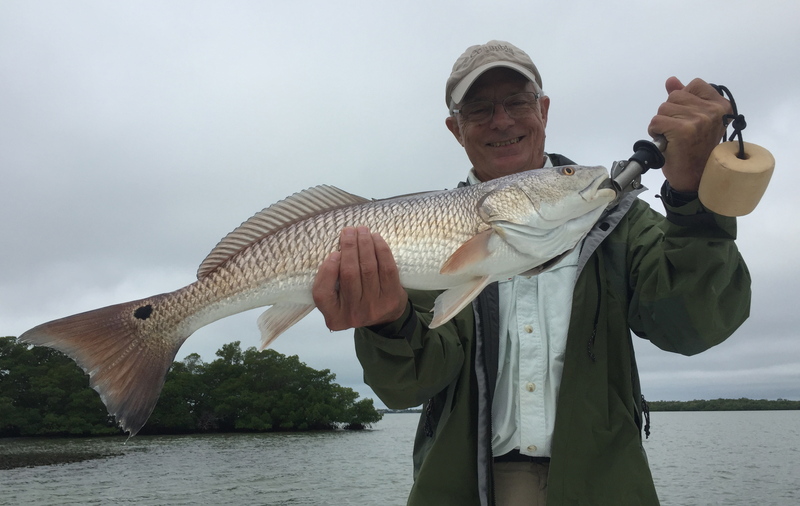 On recent trips we’ve landed mangrove snapper, gag grouper, seatrout, sheepshead and a few flounder while using live shrimp and cut baits. Keep a bigger rod at the ready for the occasional passing cobia. They’ve been showing up late in the morning after the sun is high in the sky.